Tender white-fleshed fish are the seafood equivalent of chicken, a mild and tasty ingredient that lends itself to a remarkable range of preparation methods. The best of them, such as catfish, have a moist and delicate texture that's equally at home in the finest of restaurant meals or the simplest homestyle fish fry. 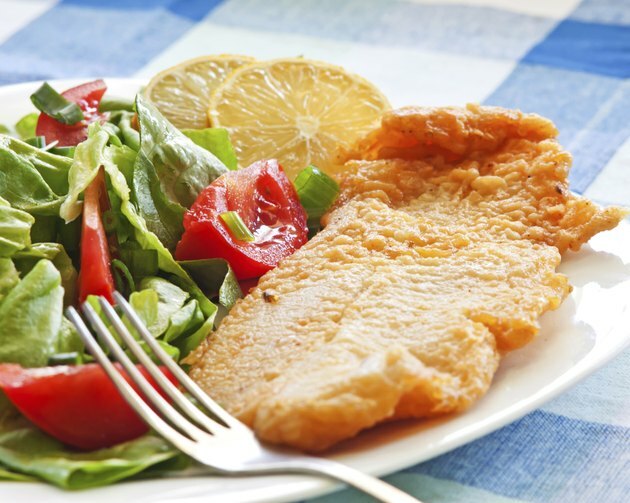 Unfortunately, like a chicken breast, catfish can quickly become dry and chewy if it's overcooked. Learning to recognize the correct degree of doneness requires experience, so check every piece. Prepare the catfish according to your favorite recipe or cooking method. Regardless of whether it's pan-fried, grilled, baked or simmered in a sauce, testing for doneness is much the same. Watch as the catfish portions change color. Uncooked catfish has a pearly translucence that changes to white as the fish cooks. By watching as the color change occurs, you'll gain a sense of how quickly the fish is cooking and when it's nearly done. This method doesn't apply to breaded catfish, since the breading conceals the color change. Press the catfish portions gently with your finger. Uncooked catfish has a soft and yielding texture, which gradually becomes firmer as the muscle proteins cook and set. With practice, you'll come to recognize the catfish's doneness by how it feels. Gently flake a portion of the catfish's flesh with the tine of a fork or the tip of a small paring knife. Choose a spot where the portion is thickest, and look at the very middle. It should just be on the verge of changing from translucent to white. The portion will retain enough heat to finish cooking the fish, leaving it still tender and juicy. Test the catfish with an instant-read thermometer to be absolutely certain. Slide the shaft of the thermometer horizontally into the thickest part of the fish, and wait until the temperature reading stabilizes. Your catfish is fully cooked when it reaches 145 degrees Fahrenheit. Many old recipes advise cooking catfish until it flakes readily with a fork. When the fish reaches that point it's actually slightly overcooked, and might be drier than you'd like. Wild-caught catfish take on the character of the water they're raised in, so before you eat them it's prudent to learn if there are any concerns about safety. Some bodies of water contain levels of heavy metals, petrochemicals and other pollutants that can accumulate in the catfish's flesh, posing a health hazard. On a more prosaic note, the fish might simply be unpalatable if the water it lived in was muddy or foul.